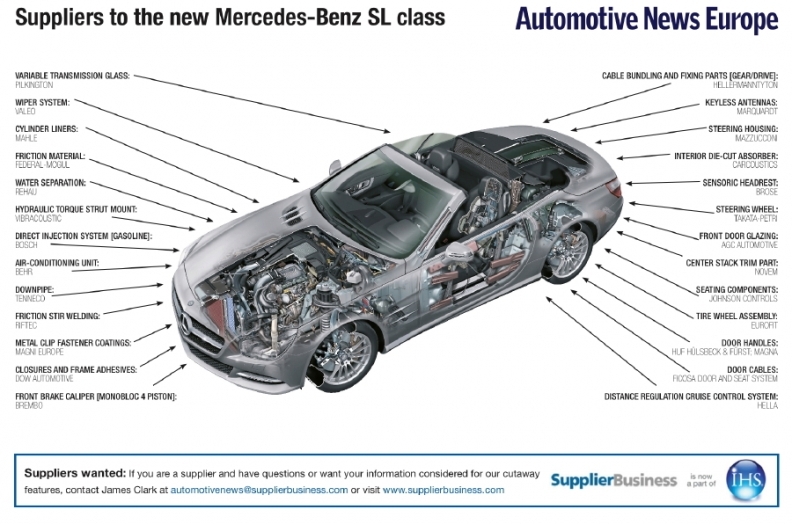 Valeo supplies its weight- and fuel-saving wiper system to the new Mercedes-Benz SL. By choosing the French partsmaker's technology, Mercedes was able to reduce the washer reservoir in the SL by 1.7 liters, which resulted in a weight loss of 1.7kg. Lighter cars use less fuel and produce fewer emissions. Valeo's system uses internal ducting and a smart pump to distribute washer fluid along the leading edge of the blade. The system, which made its world debut in the SL, helps improve the cleaning performance of the wipers while using half the fluid of conventional systems, according to the supplier. The system won an Automotive News PACE Award this year. The annual PACE Awards honor supplier innovation in products, manufacturing processes and partnerships. Automotive News is a sister publication to Automotive News Europe. Production of the new SL class began in December 2011 at Mercedes parent Daimler's facility in Bremen, Germany. Output will peak in 2012 at just over 14,500 units, falling slightly in 2013, according to IHS Automotive forecasts. In 2014, SL production is scheduled to move to Daimler's factory in Sindelfingen, near Stuttgart.